The harvest has begun. 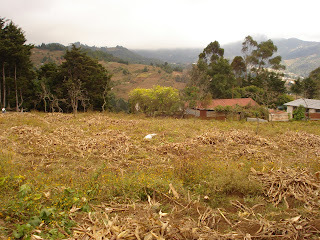 For the second time since I have arrived in Guatemala, cornfields are being flattened left and right. I can no longer walk from my bathroom into my house in a towel, the barrier of corn that shielded me from prying eyes has been razed. Entire families spend the day out in the fields gathering corn, machete-ing cornstalks and lugging ayotes (giant squash that look like watermelon). Soon all the left over dried-out foliage will be burned in giant bonfires sending smoke billowing into the air with the dust that is already rising. 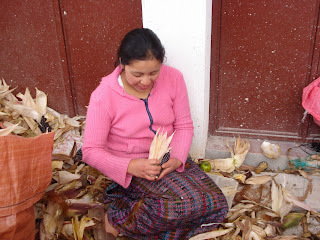 Children and adults alike spend the day shucking corn, saving corn husks to make tamales and chuchitos, separating the good from the bad and selecting those which will be used for seeds next year. The rain has stopped and the cold has set in. I am back in the habit of drinking tea, using four wool blankets and shivering in my two sweatshirts, long-underwear, scarf and wool cap. It is more than a struggle to get out of my warm bed in the morning. Camionetas and trucks that pass on the road send clouds of dust into the air drying out eyes and lungs. The wind is picking up, and electricity is the victim. 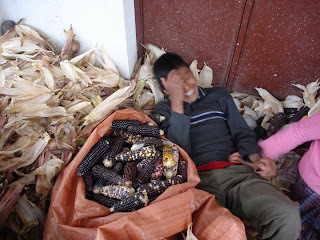 It is fall in Guatemala. Your world is so different from mine, it like we are in two separate countries. I need to get over to visit your side again soon.